Solenoid valves are used in irrigation systems to control the supply of water to the different nozzles. These valves are electrically controlled and open with the aid of an electric current through a solenoid (electromagnet). They consume energy as long as they are electrically energized. Solenoid valves open and close quickly. They are sensitive to dirt and can therefore be used only with clean liquids or gases. 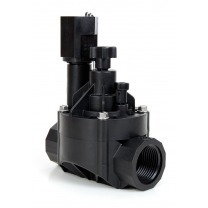 The Rain Bird solenoid valves are particularly suitable for irrigation, but may also be used for other purposes. Rain Bird solenoid valves are only available in 24V AC (alternating current). Most irrigation computers work with 24V AC, but if you prefer to use a different voltage, you can also consider universal brass solenoid valves.